The first question to ask yourself is “do I want something classic or trendy?”. Knowing the answer to this will help to direct your focus towards particular styles of ring, and so a little bit of thought on this question will save you lots of to-ing and fro-ing in the long run. For instance, trendy modern rings with quirky stones or ‘different’ designs will suit brides who fancy trying something different and not following the crowd. However, traditionalists who want their wedding ring to suit their tastes and preferences now and a few decades down the line may prefer to go for a style that is classic and timeless. Next, ask yourself “do I want my engagement ring and wedding ring to match?”. If you do, it would be a good idea to ask the jeweller to show you a ‘shadow’ band, as this style fits snuggly with your engagement ring like a puzzle piece. However, if you plan on only really wearing your wedding ring once you’re married, a shadow ring might look a little unusual on its own. You don’t need to buy a shadow ring if you want to wear both rings at the same time of course – instead, you could just ensure that you buy a wedding ring in the same metal as your engagement ring so that it matches. Also, if you and your partner are shopping for your wedding rings together, you may find that the jeweller asks “do you want your wedding rings to match one another’s?”. Like any other aspect of choosing a ring, this decision is one that comes down to personal preference and what you’ve discussed as a couple. Some couples like to choose a ring made from the same metal, but many prefer to just opt for the design they like best regardless of whether or not they match. However, you could tie the two together, so to speak, by having the rings engraved on the inside with the date of your wedding, for instance – a romantic way to choose ‘matching’ wedding rings without either of you comprising on the style you like best! Finally, a good jeweller will probably ask you something like “what’s your lifestyle like? Do you work with your hands? Do you play contact sports?”. These questions are important as they will help to determine the right style of wedding ring for you. For example, if you want a diamond wedding ring, you’ll need to choose not only which shape the stone(s) will be, but how the diamonds are set. There are many different shapes of diamond to choose from, but for individuals who are very active, sporty or work with their hands, a bezel-set style is a good idea because it will keep the diamond firmly secure. Similarly, the precious metal you choose should be based on your lifestyle too. Platinum is very durable and won’t tarnish in the same way that silver will, for instance. 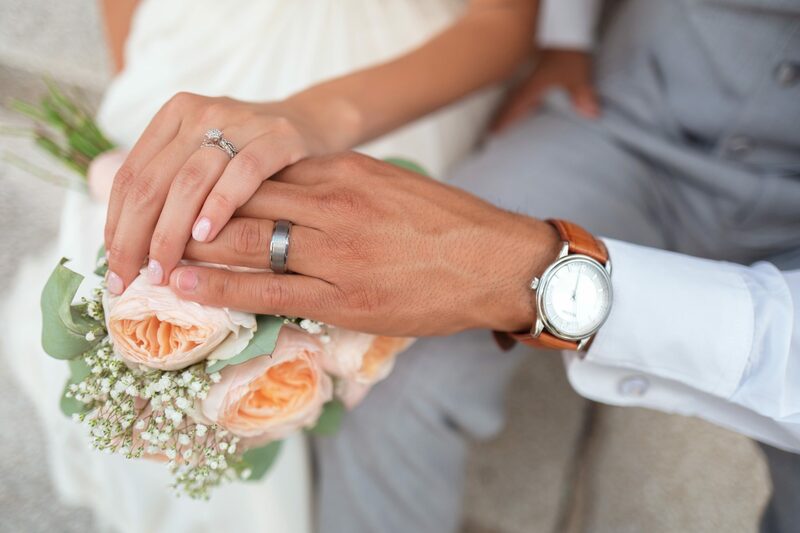 Now that you’re armed with some questions to answer, you should feel more confident that you’re choosing the perfect wedding ring. Enjoy the experience and look forward to the big day!